I have delivered machine safety training in Trade Colleges for over 35 years. I have been an ‘expert’ consultant to WorkCover (Victoria) in several workplace prosecutions and was a member of the Australian Standards committee for woodworking machine guarding. It’s fair to say that I know a little about machine safety and I would like to share some of that with you in this article. 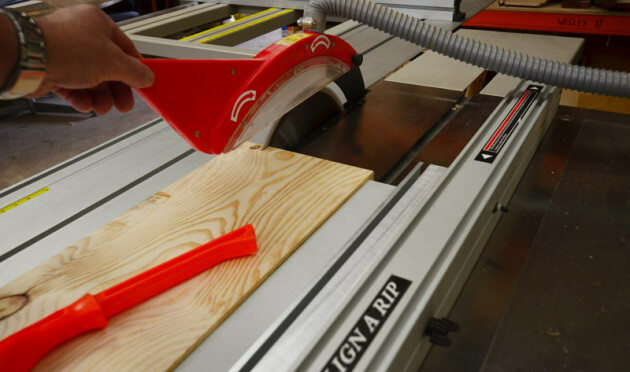 This is not just another safety commentary about machine settings; it’s about how you can take some extra steps to ensure your woodworking remains safe and enjoyable for life. Now I have to confess that I’ve received a few stitches from workplace accidents and I am ready to admit that in certain situations things happen that you have no control over. Notwithstanding this, there are steps you can take to minimise these events. My three serious incidents requiring medical attention all occurred during my apprenticeship when I was learning the trade and when I think back I can honestly say that on each occasion I could have prevented the injury by thinking about the situation more thoroughly. Before you start any machine, stop and think about what you are going to do, where your hands will be and if you have done everything you can to make the job safe. was tightening a cutter with a loose spanner. The spanner slipped, causing my hand to run down the length of the 12" cutterblade. On another I cut towards myself with a box cutter and sliced my left hand so badly that I could touch the back of my hand with my thumb. On the third occasion I was setting up a multi-spindle moulding machine while someone else was setting another cutterhead. This machine (illegal now) had only one motor that drove all the cutterheads. When the other person rotated his cutter, mine rotated too and my finger was crushed between the blade and a guide-post. I consider that each accident was my own fault because with a little thought I should have seen what was coming and changed the outcome. Experience has taught me to set up the job, then stop and think about how I’m going to physically do the work. Have I forgotten something? Are all the guards in place and set correctly? Am I using the correct tool? How am I going to hold the wood? A ten second pause at this stage can save a lot of pain and would have prevented all three of my ‘accidents’. People tend to develop habits like that golf swing you need to change but can’t because you’ve always swung it that way. If you don’t do it right from the start it’s very hard to change later on. Have you had professional machine safety training? If not, how do you know you are working safely? Remember the saying: ‘you don’t know what you don’t know’. Assuming your machines are in good condition and well maintained, that your cutters and saws are sharp and you know how to set the guards properly, the rest of your attention should be on your hands and fingers. Accidents happen when your hands are in the wrong place so let’s look at some ways to keep them away from the sharp bits and in one piece. No one machine is safer than the next so we’ll look at several common ones to set the scene for what we should be looking out for. 1. 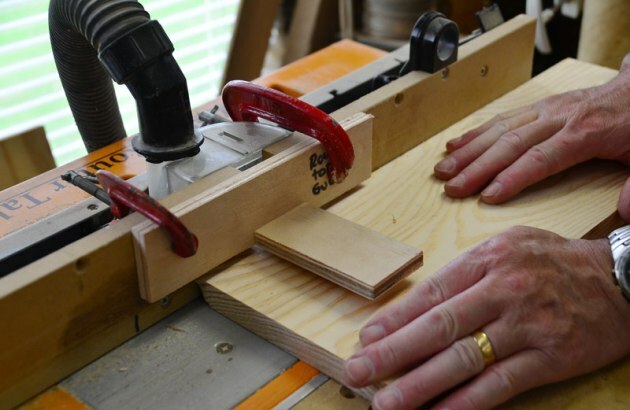 Keep fingers 100mm from the end of the board and your hands on the wood at all times. The rotating cutterhead is the area you will pay most attention to (photo 1). 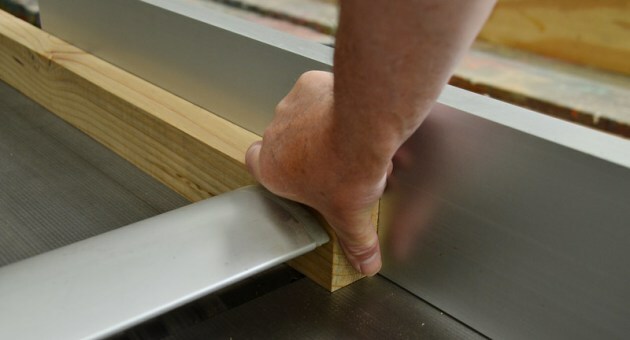 A straight edge is achieved when your timber is held down onto the rear table as it comes off the cutter. 2. Get your hands onto the rear table as soon as possible. The rear table is also the best place to have your hands so get them there as soon as possible (photo 2). There is no need to press down hard on the front table because it contributes nothing to a good result. 3. Hold the board against the fence with your fingertips so you can keep an eye on them. You only need light pressure so why not use a pushblock (photo 3)? Get your left hand onto the rear table as soon as possible. 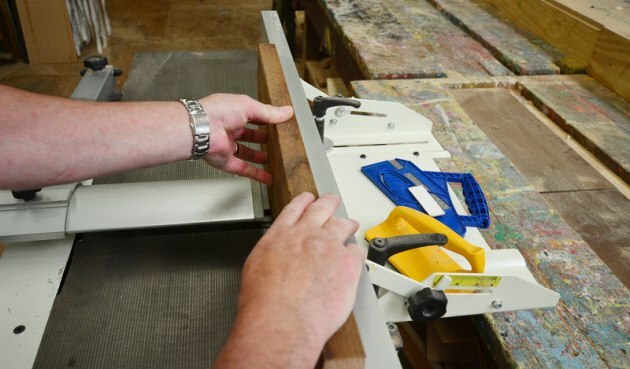 Once your hands are past the cutter the risk of an injury is significantly reduced. 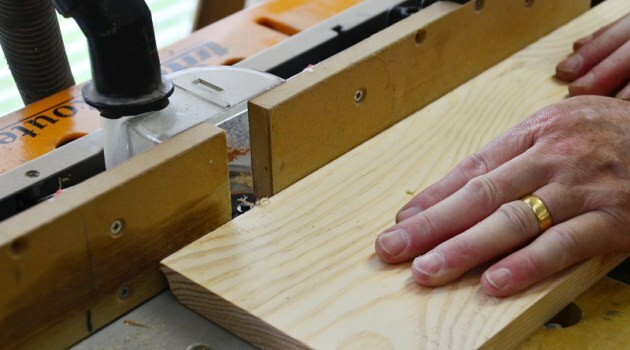 Hands tend to slip forward when feeding wood so keep your fingers at least 100mm from the front and back of the board and take light cuts. 4. Having a finger on the wood when using a pushblock provides some feel. When shooting the edge of a board you won’t need much pressure at all because the edge being cut is very narrow. Placing your hands flat against the face of the board and pressing it onto the fence will not allow you to see all of your fingers. You only need your fingertips to keep the wood against the fence and doing this enables you to see all of them so you won’t be cutting any off (photo 4). 5. Following the board with a thumb is never a good idea. Your right hand should be on top of the piece and never, ever have a finger or thumb pushing from the back of the board (photo 5). This is a habit that’s very hard to break and one day the wood and your overhanging finger will be about the same size and guess what happens then? 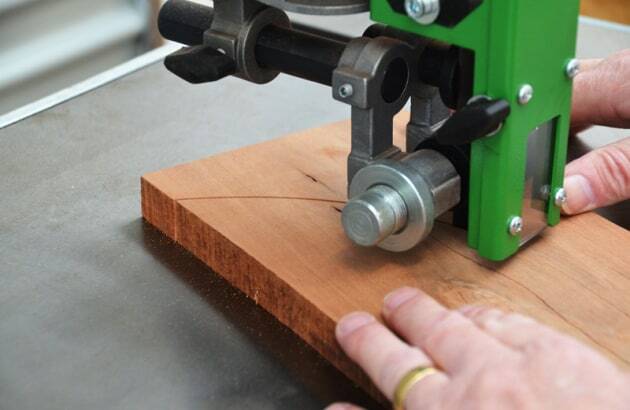 If your planer has a mutton guard it should spring back to always cover the cutters. If you have the more common bridge guard you must adjust it manually so the cutters are always covered; the only exception being when you are shooting an edge. 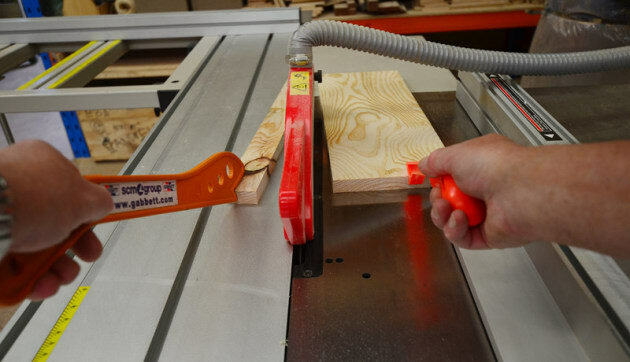 Whatever sawbench you use, the safety principles will remain the same. The tips of a sawblade travel at over 200kms depending on the size and RPM of the blade. This means that if your wood jams against the side of the blade it could potentially be thrown back at you at this speed. I have seen a stick of wood ejected back and go through a brick wall! If you are standing behind the wood when this happens, your groin area is going to take quite a wallop! 6. Set the short fence to the depth of the gullets. 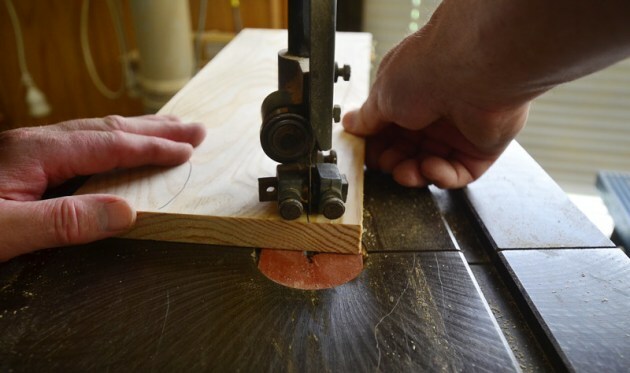 If there is tension in the wood and you cut it with a sawblade the wood may either spring out, away from the blade, or spring in onto the blade. If it springs onto the blade the riving knife (splitter) should keep the wood off the blade. Either way the wood will be jammed between the sawblade and the fence. This is particularly dangerous on a panel saw where the rip fence is usually long and extends past the rear of the blade. But you should be able to find a shorter fence amongst the bits and pieces that came with the machine and this can be set so the end of the fence extends just to the depth of the gullets (photo 6). Any bow will have room to move as shown in photo 7 below. 7. 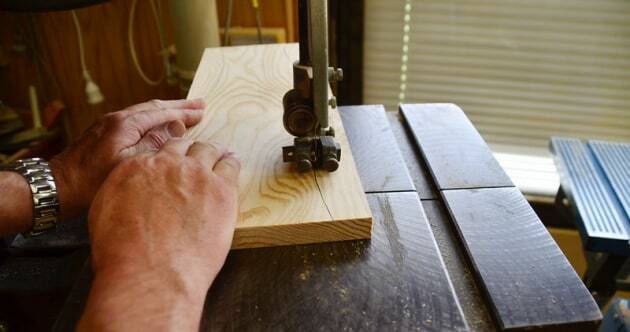 When cut, the wood is not jammed between the blade and the fence. 8. Keep fingers well away from cutters. The shaper is possibly the most deadly of all woodworking machines because of its potential to do short, narrow and curved work that’s difficult to hold safely. 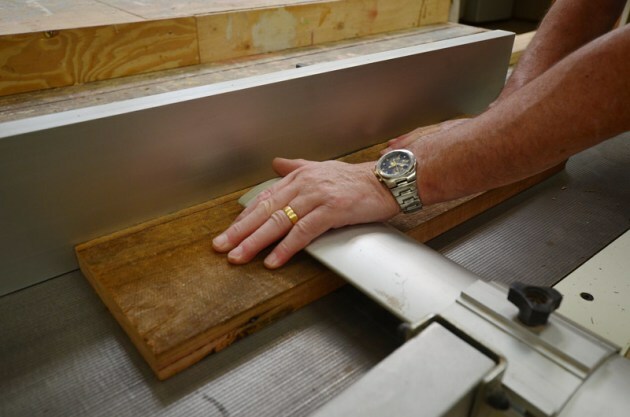 A detailed account of shaper safety cannot be covered here but suffice it to say that your hands should never be closer than 100mm to the cutter on any woodworking machine (photo 8). 9. A simple guard keeps hands away. Here especially, you should stop and consider what’s going to happen if the cutter gets hold of the wood and throws it out of the machine...and you have all your weight pressing the wood against the cutters. When the wood is gone, there’s nothing between you and a certain serious injury. 10. Easy to make comb guards. Complex jigs are used in industry to prevent accidents but most serious furniture makers now use CNC machines on these small complex pieces. 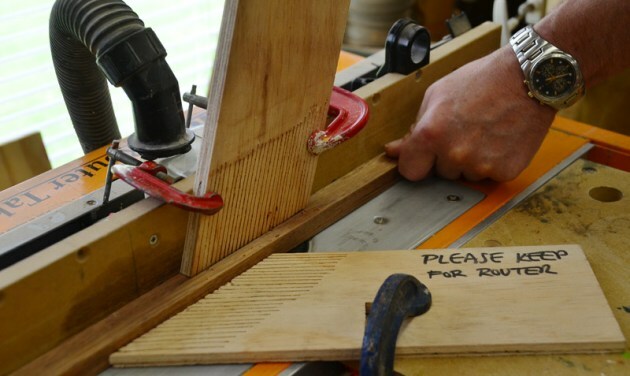 Photos 9 and 10 show two simple ways you can keep your hands away from the shaping (router) cutter when doing straight mouldings. 11. Keep hands away from the line of cut. This machine is responsible for far more accidents than you would think, mostly because the guidepost and guard were set too high. If you can get a finger between the top of the wood and the guidepost, it’s too high. Another problem with this machine is that the position of the cut is constantly changing in relationship to your hands. It’s for this reason that you should never have your hands on the line of the cut and this applies to any sawing machine (photo 11). 12. Keep guidepost as low as possible and your hands clear of the line of cut. As with the surface planing machine, once your hands are past the cutter (in this case the blade) it will be infinitely safer. Practice moving your hands behind the blade about half way along the cut and pulling the work through rather than pushing. With the guide post almost sitting on top of the work, the only way you’re going to hurt yourself is if your finger is at the end of the cut and right on the cut line (photo 12). There are other things that can make your work unsafe, especially on machines. If you are working alone, does someone know you are in your workshop? Do you have an intercom with the house? How is your stress level? If you’re working long hours or have a heavy workload you may not be concentrating as much as you should. Do you take regular breaks? Schedule your most demanding tasks early in the morning when your concentration is at its highest level. Need I mention not to drink alcohol while working machinery? Check the lighting and dust extraction to make sure they are adequate for the work you are doing. Have you enough room around the machine to work safely without bumping into other equipment. Many machines can be fitted with extension tables and these help you to work safer. Make sure your floors are in good order and of course keep the place neat and tidy. I’ve still got ten fingers and with a little planning and thought, you can keep yours as well. 1 Arrange your work area so everything is within easy reach. 2 Use mechanical aids if possible. 3 Remove setting tools from the machine before turning on the power. 4 Ensure cutters and blades are sharp to cut freely, not forced. 5 Isolate the power supply before changing, cleaning, or adjusting a machine. 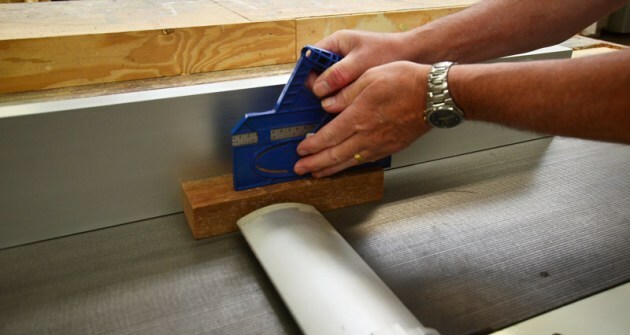 6 Use jigs if possible to keep hands safe. 7 Use a pushstick or block to push material into the cutting area. 8 Keep hands out of the line of the cutting blade. 9 Clamp down and secure all workpieces when drilling. 10 Wear protective equipment to suit the task. 11 Avoid awkward operations and hand positions. 12 Wear close fitting clothes and remove loose jewellery.